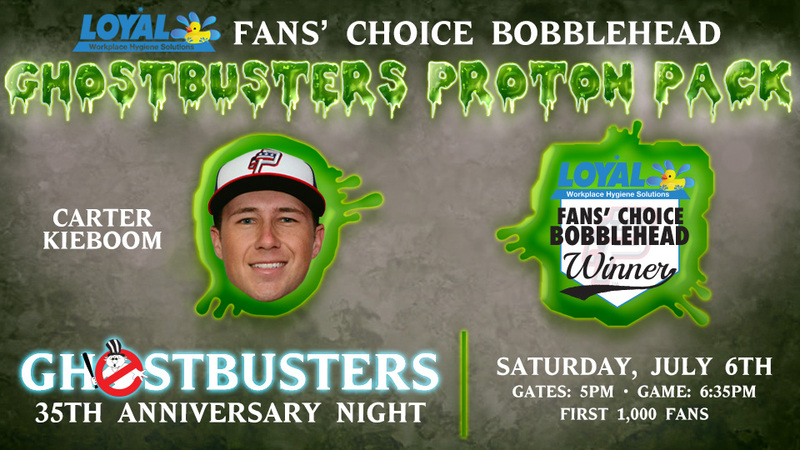 Following a close vote over the past month, the Potomac Nationals are happy to announce that the player who will be featured on the Loyal Hygiene Solutions Fans' Choice Ghostbusters Proton Pack Bobblehead is Carter Kieboom! The fans' choice bobblehead will be handed out to the first 1,000 fans at Northwest Federal Field at Pfitzner Stadium on Saturday, July 6th as the P-Nats host the Wilmington Blue Rocks (Kansas City Royals). Gates will open at 5pm, with first pitch set for 6:35pm. The night will also be Ghostbusters 35th Anniversary Night. This is the fourth consecutive year that the P-Nats have planned a fans' choice bobblehead giveaway. This year's edition follows last season's Tanner Roark & American Eagle Team USA Championship Clinch bobblehead, 2017's Jayson Werth and Dan Kolko dual bobblehead and 2016's Gio Gonzalez and his dog Stitch bobblehead. 2019 ticket plans are currently available for the upcoming season. To purchase a ticket plan, or if you have any questions, please reach out to the Potomac Nationals Extreme Custom Collision Ticket Office at 703-590-2311, ext. 221/225, or e-mail Director of Season Tickets and Group Sales Alec Manriquez at amanriquez@potomacnationals.com or Ticket Operations Manager Matt LeBlanc at mleblanc@potomacnationals.com. The Potomac Nationals of the Carolina League play at Northwest Federal Field at Pfitzner Stadium in Woodbridge, Virginia, and are the Carolina League affiliate of the Washington Nationals. The Potomac Nationals have claimed five Carolina League Championship titles (1982, 1989, 2008, 2010, and 2014) and 10 CL Northern Division Championships. Sponsorship opportunities for the P-Nats' 2019 season and beyond are available, as well as all-inclusive corporate picnic outings to watch the future stars of the Washington Nationals at The Pfitz. 2019 Potomac Nationals season tickets are now on sale, while mini plans will be available soon. For more information on Potomac Nationals 2019 season tickets, mini plans, group outings, picnic packages, fundraisers, and all things Red, White, and Blue, visit the P-Nats online at www.potomacnationals.com, follow the P-Nats on Facebook (@PotomacNationals), Twitter (@PNats42), and Instagram (@pnats42), or call the Potomac Nationals' Extreme Custom Collision Ticket Office at 703-590-2311.